WASHINGTON (Reuters) - The Republican leader of the U.S. Senate offered legislation on Tuesday urging the United States to keep troops in Syria and Afghanistan, as President Donald Trump's administration moves toward withdrawals of American forces after years overseas. 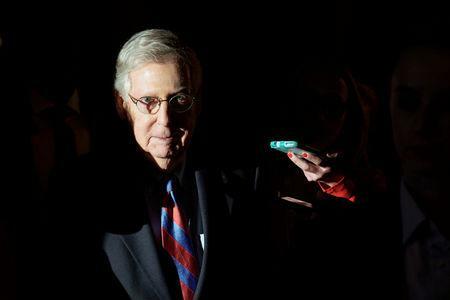 Saying that Islamic militant groups in the two countries continue to pose a "serious threat" to the United States, Senate Majority Leader Mitch McConnell said he had introduced an amendment to a broader Middle East security bill urging a "continued commitment" until al Qaeda, Islamic State and other groups are defeated. "We're not the world's policemen, but we are the leader of the free world, and it's incumbent upon the United States to lead, to maintain a global coalition against terror and to stand with our partners," McConnell said in a speech in the Senate. The measure would be an amendment to a broader Middle East security bill being debated in the Senate. That bill, which includes fresh sanctions on Syria and a measure combating the Boycott, Divest and Sanctions (BDS) movement against Israel, advanced in a procedural vote on Monday. There was no immediate word on when the Senate might vote on whether to pass the bill, including the amendment. To become law, it would also have to pass the Democratic-controlled House of Representatives and be signed by Trump, or overcome a Trump veto if he will not sign. 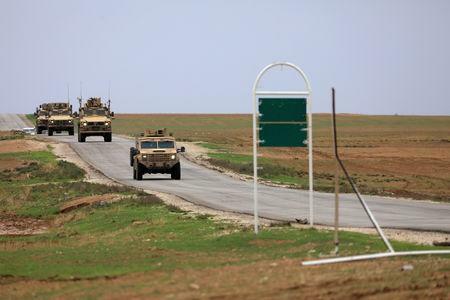 Trump's administration has announced plans to bring all U.S. forces home from Syria, saying that the Islamic State militant group had been defeated. Separately on Tuesday, Trump's director of national intelligence, Dan Coats, told a Senate hearing on worldwide risks that Islamic State remains a threat. On Monday, a U.S. special envoy said the United States and the Taliban have sketched the outlines for an eventual peace accord to end 17 years of war in Afghanistan. However, there was no sign the group had accepted key U.S. demands such as committing to a ceasefire before a withdrawal of U.S. troops. Nor did the special envoy, Zalmay Khalilzad, agree in talks with insurgent negotiators last week in Doha to a withdrawal of foreign forces from Afghanistan within 18 months, as Taliban officials claimed, said a State Department spokesperson. “We have not agreed to any specific timeline for a possible drawdown of troops,” the spokesperson wrote in an email.